This is a “speculative” posting. It’s largely just so that I can collect some bits of ideas together in one place. I’ve not reached a conclusion. I’ve not even fully worked out the connections. But my progress is not as fast as I’d like, so it’s going here as speculation. Where it can remind me of the “unfinished bits” and where others can chime in if they see something interesting. has a nice write up of the geologic scale events that lead to a frozen Antarctic, including the impact of the closing of the Isthmus of Panama and the opening of Drakes Passage. My thesis here is basically that the Drakes Passage event was not an atomic event. It is a ‘gradation spectrum’ and further, that the degree of impact is still variable. Both with changes of water level AND with changes of wind speed of the Antarctic Cirumpolar Winds as they drive the Antarctic Circumpolar Current (ACC). This all started with the weather this year. The Arctic Oscillation, or AO, changed and Europe got frozen along with Canada and the USA Midwest. One chain of things lead to another and I was looking at the ANTarctic Oscillation too. (Called the AAO). I was wondering if there was some way that these might account for the cold we’re getting now. Maybe they were both weakening and letting all the cold out of the Polar Lockers? But when I looked, the AO and AAO seemed to be moving in opposition more than in unity. What could be the deal? I’d seen hints of an alternation between polar regions in some of the temperature data. One place warming when the other cools. The idea of both working together to cool things off was not looking so hot. But… the cooling in the south Pacific looked like it had to be WATER driven, while that in the north was clearly AIR driven. Was there something in that difference that mattered? So I looked more closely at the AAO. The south pole circumpolar wind drives the Southern Ocean current. 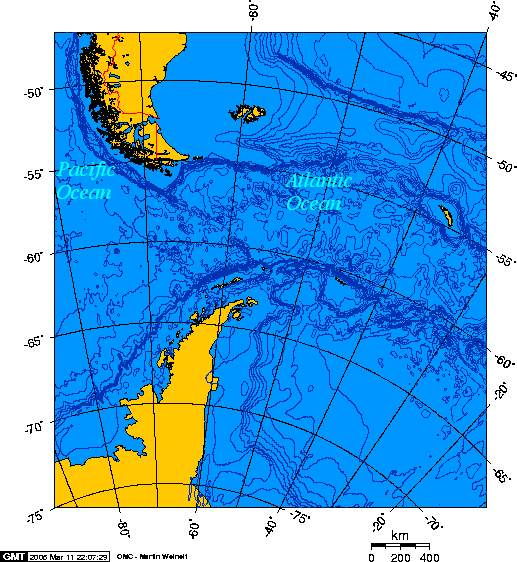 Called the Antarctic Circumpolar Current. 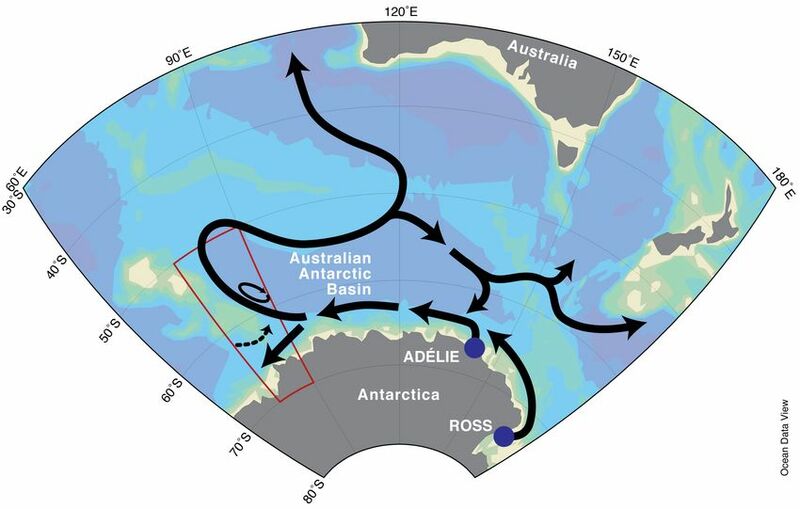 So if we had MORE wind down south when we had LESS up north, that would speed up the ACC… which would move more water faster around the Southern Ocean… untill… it bangs into Drakes Passage. That bottleneck in the Antarctic Circumpolar Current between South America and Antarctica. At that point, we’d have an interesting problem. There is an interface between the Antarctic side and the rest of the oceans called the Polar Front. And, as the polar side is fully land constrained, ought to move the polar front somewhat more north. Perhaps even putting more deep cold polar water into the mix. Hmmm…. Now I’m thinking: So, let me get this straight. If we have a natural OFFSETTING and balanced oscillator that swaps circumpolar wind speeds between the North and South poles, such that when one speeds up the other slows down, that will cause warming and cooling cycles globally? When the Arctic wind speeds up, it traps cold air, warming the N.H., but the S.H. winds slow down, slowing the water currents that lets the oceans warm up. Warming in both cases. And like now, when the Arctic wind slows down and lets the freezer door open to the Northern Hemisphere, the Antarctic wind picks up speed and sends more cold water into the Pacific and we get pressure toward cold everywhere on the planet. Cooling in both cases. What ought to be a “wind changes offset and do, net, nothing globally” is instead a “hot / cold oscillator”. All because one end has a lot of land and the other has a lot of water around the pole. The Arctic is almost land locked, so air changes dominate while the Antarctic is a nice wide open circumpolar run for the water, but the air has no land forms pushing it around. Until that water hits Drakes Passage. Geomagnetic field in both North and the South hemisphere has an effect on the polar vortex, eventually reflecting its influence on the global atmospheric movements, polar and global temperatures. Stronger westerly winds around Antarctica are increasing eddy activity in the Southern Ocean and consequently may be driving more heat southward across the formidable Antarctic Circumpolar Current – the world’s largest current (see map below). Winds over the Southern Ocean are strengthening due, at least in part, to human-induced change such as ozone depletion and greenhouse gas emissions. Scientists, examining satellite measurements of the ocean surface and using high-resolution computer models, have found that the Antarctic Circumpolar Current only shows a slight acceleration when these winds blow stronger, but that there is a large increase in ocean eddy activity. Eddies are the ocean equivalent of atmospheric weather systems, and in the Southern Ocean they play a key role in moving heat southward toward the Antarctic continent. So they have ALMOST got it. Faster currents. More eddy action. Cold water headed out (being replaced by water a bit warmer). They just get the understanding all backwards. It takes TIME for the impacts to work through. We’ve now got that cold water making it to the central Pacific and that “warmer Antarctic water” has had it’s heat dumped to space (judging by the SST map above). The Antarctic Circumpolar Current (ACC) is an ocean current that flows from west to east around Antarctica. An alternative name for the ACC is the West Wind Drift. The ACC is the dominant circulation feature of the Southern Ocean and, at approximately 125 Sverdrups, the largest ocean current. It keeps warm ocean waters away from Antarctica, enabling that continent to maintain its huge ice sheet. The ACC has been known to sailors for centuries; it greatly speeds up any voyages from west to east, but makes sailing extremely difficult from east to west; though this is mostly due to the prevailing westerly winds. The circumstances preceding the Mutiny on the Bounty and Jack London’s story “Make Westing” poignantly illustrated the difficulty it caused for mariners seeking to round Cape Horn on the clipper ship route between New York and California. The clipper route, which is the fastest sailing route around the world, follows the ACC around three continental capes – Cape of Good Hope (Africa), Southeast Cape (Australia) and Cape Horn (South America). Though you can see how the edge of it runs into the land form at the tip of South America. Sometimes I think you could have a gold mine of easy discovery just by taking any assertion of causality the Warmers put forth and turning it exactly around, as they are so often “exactly wrong”. Nice Theory, Got any DATA? It fits. Nice theory. But…. Got any evidence for the AO and AAO moving in opposition? And just what IS the relationship between those pressure oscillators and the actual wind speeds? But I did find data for the AO and AAO so I’m hoping they are a decent proxy for wind speeds. They do show something of a complementary behaviour, but with a fairly fast cycle. To do this properly would require a “low pass filter” to make longer duration trends out of this stuff. For now, just kind of ‘visually integrate’ and notice how much blue or red is above / below the line for each time series. Now comes the hard bit (that could undoubtedly be done much more correctly with decent raw data and a clean mathematical comparison… but I’ve not had time. So we get to use the error prone “eyeball” technique). Take a look at the overall time periods. When one is red, and the other tends to blue. Easiest “pick” is the tail end. Right now the AO is blue (as Europe and North America feeze) and the AAO is blue. From about 1999 to date, the AO has been mostly red while the AAO has been more blue. 1979 has a very blue AO and a very very red AAO. But in 1980 they both go quite blue, then there’s a decade of nothing much happening. No strong bias to either side. The details, like ’83-’84 being opposites, then do tend to confirm the opposite sign tendencies, though. Yet in ’89 the AO goes VERY red and it isn’t until ’92 that the AAO goes VERY blue. So there are likely some timing issues that the “Mark One Eyeball” just can’t get. (And I’d really rather be doing this with simple circumpolar wind speeds in any case). All in all, I think there’s “enough here, here” to be a decent “Dig Here”. I know it’s an unfinished symphony. It hints at interesting things, and teases about brilliant insights, that it then says are hidden just at the end of that rainbow over there. But that’s how an investigation is, mid stream. To me, it looks like there is some grand “Bi-Polar Oscillator” at work. One with about a 60 year period. It stirs the air (that then stirs the waters) and we get long bits of hotter and colder as things that ought to offset end up amplifying. As some minor “wind shift” gets turned into “30 years of cold or hot”. And that leaves me wondering what the world would be like if Drakes Passage were just a little bit wider? And how much does it enhance ice ages when the water becomes 400 feet more shallow and Drakes Passage that much harder to cross, sending that much more cold water north? An international team of investigators under the leadership of two researchers from the UAB demonstrates the response of the Atlantic Ocean circulation to climate change in the past. Global warming today could have similar effects on ocean currents and could accelerate climate change. The Atlantic Ocean circulation (termed meridional overturning circulation, MOC) is an important component of the climate system. Warm currents, such as the Gulf Stream, transport energy from the tropics to the subpolar North Atlantic and influence regional weather and climate patterns. Once they arrive in the North the currents cool, their waters sink and with them they transfer carbon from the atmosphere to the abyss. These processes are important for climate but the way the Atlantic MOC responds to climate change is not well known yet. Someone needs to tell them that the “Science IS SETTLED“; as we're constantly being reminded by the AGW Policy Police. An international team of investigators under the leadership of two researchers from the UAB now demonstrates the response of the Atlantic MOC to climate change in the past. The new research results will be published on 4 November 2010 in the international front-line journal NATURE. The research project was led by Rainer Zahn (ICREA researcher) and Pere Masque, both of the UAB at the Institut de Ciència i Tecnologia Ambientals (ICTA) and Department of Physics. With collaborators at the universities of Seville, Oxford and Cardiff (UK) they investigated the distribution of isotopes in the Atlantic Ocean that are generated from the natural decay of uranium in seawater and are distributed with the flow of deep waters across the Atlantic basin. Groaannn …. more simulated model science. Sometimes I wonder why we ever let them play with the new shiny computer toys in the first place. And notice, not a peep about the potential impact of Drakes Passage and, oh, I don’t know, maybe a whole lot lower ocean and a huge load of ice in it? a reversal of the deep Atlantic circulation under such conditions while it is only now with the new data generated by UAB scientists and their colleagues from Seville and the UK that the details of the circulation reversal become apparent. This situation occurred during the ice age 20,000 years ago. Although this was far back in time the results are relevant for our climate today and in the near future. The new study shows that the Atlantic MOC in the past was very sensitive to changes in the salt balance of Atlantic Ocean currents. Similar changes in seawater salt concentration are expected to occur in the North Atlantic in the course of climate warming over the next 100 years. Therefore the data to be published in Nature offer the climate modelling community the opportunity to calibrate their models and improve their capacity to predict reliably future ocean and climate changes. 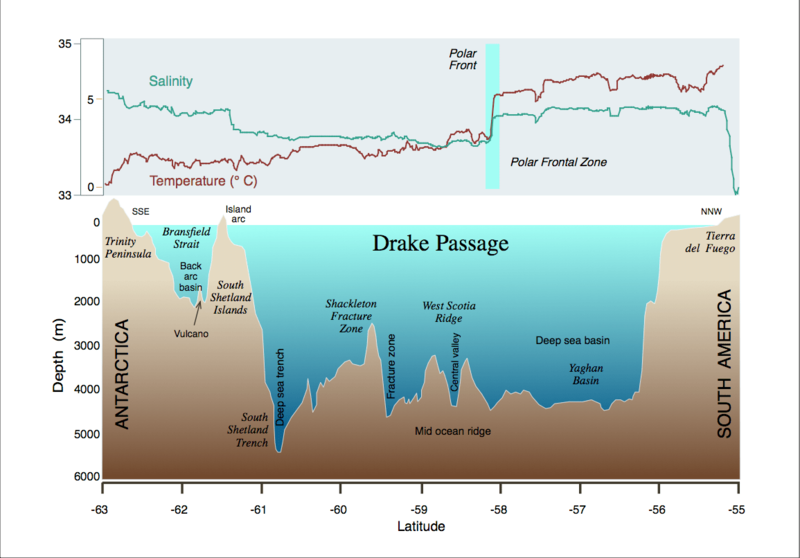 Perhaps they could start by looking at what happens to ocean currents in Drakes Passage during an ice age? As a final note, this bit of a news tease. We still don’t know how all the currents work. And they are, IMHO, the keys to the city. So, as of April of this year, we’ve just discovered a “massive” unknown current… Wonder how that one works? So much for “settled science” ;-) I’ve bolded some bits. (PhysOrg.com) — A deep ocean current with a volume equivalent to 40 Amazon Rivers has been discovered by Japanese and Australian scientists near the Kerguelen plateau, in the Indian Ocean sector of the Southern Ocean, 4,200 kilometres south-west of Perth. In a paper published today in Nature Geoscience, the researchers described the current -more than three kilometres below the Ocean’s surface – as an important pathway in a global network of ocean currents that influence climate patterns. So, like, maybe now we’ll start to get a handle on the Indian Ocean Dipole too? This looks like an eddy from the venturi made by Drakes Passage. Perhaps as things “back up” at South America you get more of that ‘deep return current’ behind the traffic jam? That would imply that at times of greater volume flow it would pick up in speed too (faster ‘jet’ spinning it faster). As the size of Drakes Passage is pretty much fixed, backing up the current ought to make more turn ‘down and out’. After the venturi, the flow ought to be up higher, too, so a bottom return current would be expected. It ought to be a quick and easy thing to falsify or confirm. Circumpolar current speed vs Antarctic Vortex speed vs Indian Ocean Dipole state (with time lags). This entry was posted in AGW Science and Background, Earth Sciences, Science Bits and tagged Arctic, Currents, Global Warming, ice, Oceans, weather. Bookmark the permalink. Tom Woods might be the man to watch, he presented at the May conference that Leif promotes. He concentrates on the Extreme UV wave lengths which show a marked decline compared with the last minimum. Low EUV is responsible for our record low Thermosphere, which may be the trigger for the current observed negative AO & NAO oscillations. Here is a mine of info on the annular (circular) modes of geopotential height variation associated with the shift of atmospheric mass from the poles to the mid latitudes, the low latitudes and across into the summer hemisphere. The variation in geopotential height increases with elevation, originating in the lower mesosphere. And, speculating again, may be things happen more “a la Velikovsky”, more rapidly, by sudden and dramatic changes and its cause should be sought up above. It seems to be that the “The devil is in the details”, but how to disentangle a tangle, when “post normal sense” advices: “the more complicated, the more intelligent” …better not to talk about forbidden things like general laws of nature, it is not “cool”, better we talk about chaos and models, that’s nicer. Vukcevick’s southern vortex moving this current? …you almost said it; Those currents (electric?) are, btw, arranged at 90 degrees from the GMF, then they have to be electrically driven (along with the winds and the earth’s turning). The question is: When does the whole system flip-flop?, Is any regular cycle behind? Adolfo you may have a point, location the new current appear to be very close if not identical to that of the magnetic pole ‘vortex’. (top map in the link). – Coriolis Force exerting similar effect on both: magma below and ocean above. – Magnetic field having an effect on the moving conductor (saline water) . I do appreciate it, but it will like be a day or two before I can get to it…. So I’m more lamenting that I have to do more than just file the email…. I’ve lost track of where I saw it. I think it was in a Discover Magazine story about 8 ? years ago… But the story was about the creation of a magnetic sphere via spinning a ball of liquid sodium. I’ve found other articles on line that I’ve linked to at times, but not the one that had the map of global magnetic lines of force. What made it particularly interesting was that it showed the minor nodes, not just the major trends. And it showed how the field was likely to develop going forward. What happens is that we have a polar reversal of magnetic field. BUT it does not happen by just “swapping ends”. What happens is that first the present field becomes “chaotic”. We start sprouting N and S poles in odd places. There is not a problem of “no magnetosphere” but rather a problem of having a dozen or two different poles with some coming and going as lines of flux break the surface. Rather like we see on the sun in the solar magnetic maps. We’ve been having “magnetic weakening” for a while now (100 years?) but what is not discussed much is that it’s irregular. It’s “weak” near places that are starting to change polarity…. What I remember most about that image (which I can’t find) is that one of the minor reversal places was in The Bermuda Triangle. And with a little sporadic nudge now and then, as that loop of magnetic force pops through the serface and recedes, you could easily get the observed sudden ‘crazy compass’ (as a new S pole pops up a few miles away, then sinks again a couple of hours later). There would also be the potential for auroae over these “poles’ if they were strong enough and persistent enough. So various electric and glow discharge effects would be seen. Now I look at the magnetic plot in Vukcevic’s page and see two N poles. He attributes that to two vortexes, yet it’s also the case that one spinning ball of metal can make multiple poles… so I’m thinking maybe this indicates an early stage of the multi-pole transition state… (Don’t worry, it would likely take many years to change much – i.e. become more chaotic). So, were all that to be found “true” and we’re heading into a magnetic pole “reversal” (not a rotational pole shift nor a crustal shift, just a swap of magentic poles): One of the very first things you would detect is places where the compass starts to go way off and there is a local “N Pole” or “S Pole” comes into being. Given all that, if there’s something talking about strange vortexes in the sky and other odd things, my first “go to” answer would be to check the magnetic field there and see if we’ve just had a magnetic loop break the surface (as hapens on the sun every day). Then I’d look to see if there were increaseing activity of that sort globally and we’re having more trend into a “magnetic pole reversal”. That would be completely normal and expectable. Doesn’t take any alien contact, nor grand conspiracies, nor evil HAARP weaponry, nor even any new physics. But it would be “exicting enough” for me. I know, not as “exciting”. But it fits all the known facts, so Occam rules. Oh, and notice that the Molniya Orbit has things parked (see the image in the link) or “visiting” just about the lattitude of where HAARP is located. Sooo…. Say I wanted to “play games” with a Soviet Spy Sat at that location… I build a large and very powerful beam steering array at the same latitude on US soil, then I can just pump a few Megawatts into the satellite’s antenna and “guts” any time I like. Put out a ‘cover story’ that it’s some kind of research facility, add a ‘counter story leak’ that it’s for weather control; then sit back and let those two storys fight it out and distract everyone else from the “Spy Fry” role… Every so often, down a Soviet bird just before you do something “interesting”. Not enough to raise suspicions, just enough to do the “interesting” things unobserved and increase the other guy’s costs. Add to your ocean pumping the constant dragging of water from east to west by the sun and moon. This, by volume, is strongest at the equator, causes up welling in the east and warm pooling in the west. One more piece in the puzzle. Translation: Homopolar motor. And, anything that goes round has to have two opposite forces acting on it. As for the Haarp thing: As strong an influence as CO2 , we are but microscopic fungi on the earth (BTW: fungi breath oxygen). That is why I recommend option 2. You install that browser which is easy and from there click the link to the extension for Webpage Screenshot, click install and it install easily and it puts an icon of a camera in the task bar in the upper right hand corner of your browser screen. From there anything you want to screencap just click the camera and answer the simple question of visible or full page. From there it puts the screen cap into a basic editor screen which is not hard to use and save right from there. About “Chaos”: It is a good justification for not knowing…or when your wife appears around. I have sometimes engaged in a thought experiment of what the South Pole would be like without Antarctica or with an equatorial “Pangaea” with no land near the poles and came to the conclusion that the planet would probably cool considerably but there would be no or little sea ice. The problem is that the water would cool and eventually sink and produce a gyre at the pole. Little ice would form because of warm water constantly arriving to replace the cold water that sank but it would be a very efficient mechanism for cooling the ocean water in the polar winter. So while there might be no / little sea ice, the overall temperature of the ocean at depth would likely decrease. 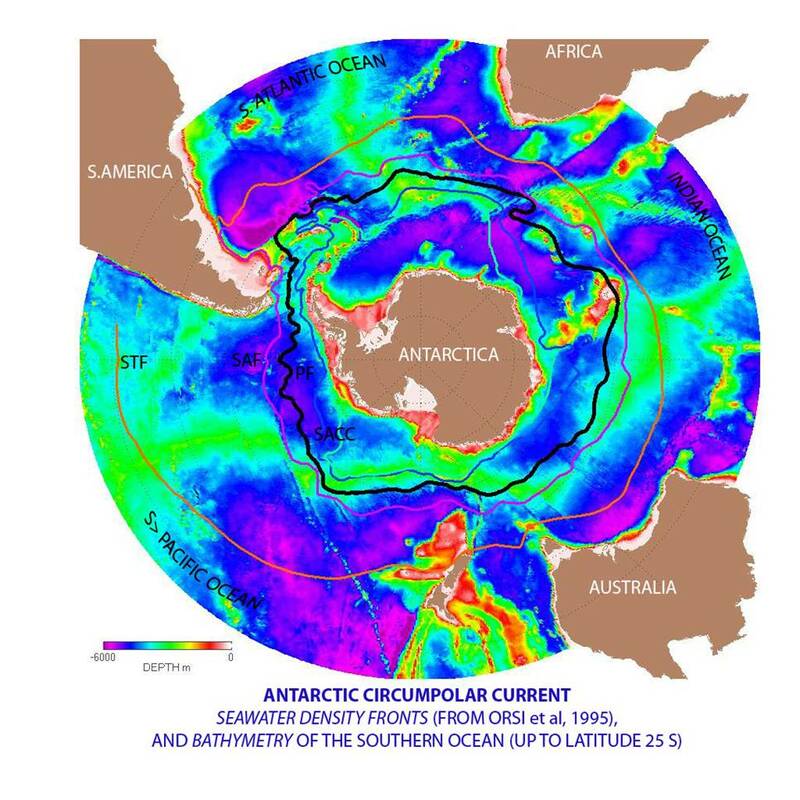 Are you familiar with the Antarctic Circumpolar Wave (ACW)? Not the same as the Antarctic Circumpolar Current. Any ideas on how to “pick one” of those that’s the active character? @ E.M. Looks like a new paper is out dealing with large scale paleoclimate shifts from the Antarctic Current. I think the lack of white (snow / ice) would result in net heat gain from sunlight.